The classic television series that was nominated for four Emmys during its successful 5-year broadcast is back starring James Garner, Jack Kelly, Richard Long, and Leo Gordon. 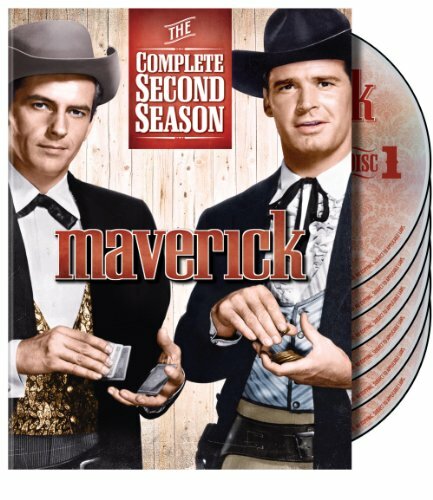 The classic television series that was nominated for four Emmys during its successful 5-year broadcast is back with its second season on DVD, as Warner Bros. Home Entertainment Maverick: The Complete Second Season onto DVD April 23. The series, which spun off a 1994 feature film starring Mel Gibson and two other series in the early 1980s, stars James Garner as a card shark travelling the Old West with a sense of humor and a knack for getting into trouble. This six-disc set includes all 26 one-hour episodes from the second season. Maverick: The Complete Second Season is priced to own on DVD at $39.98 SRP.